Who loves candy bars? I do! I do! I even love repurposing and baking with them even more. Oh the creative things that you can come up with from just a simple little candy bar. Yum. 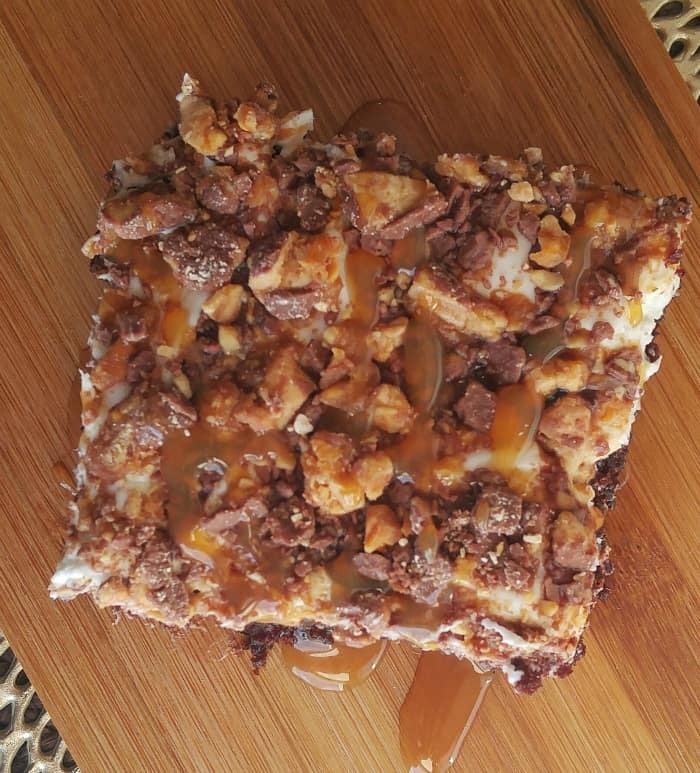 I had a few mini Snickers bars leftover from when I used the for building my amazing Snack Stadium and I wanted to find something creative to do with them. 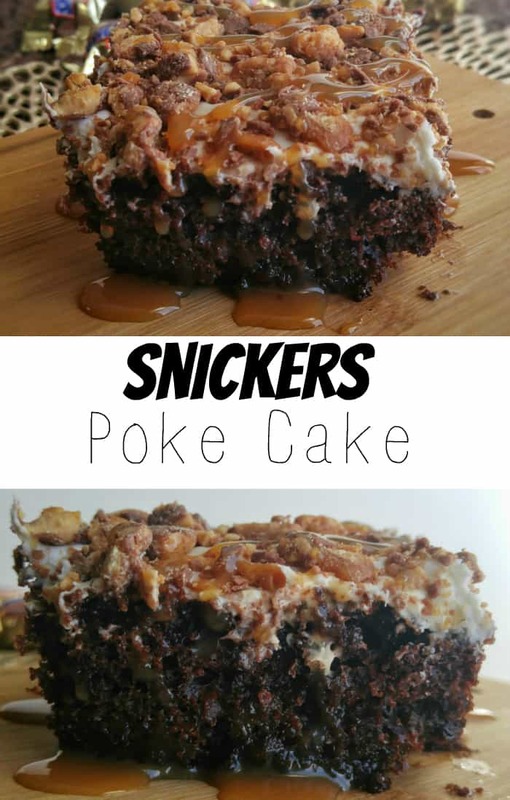 Let me welcome the Snickers Poke Cake. 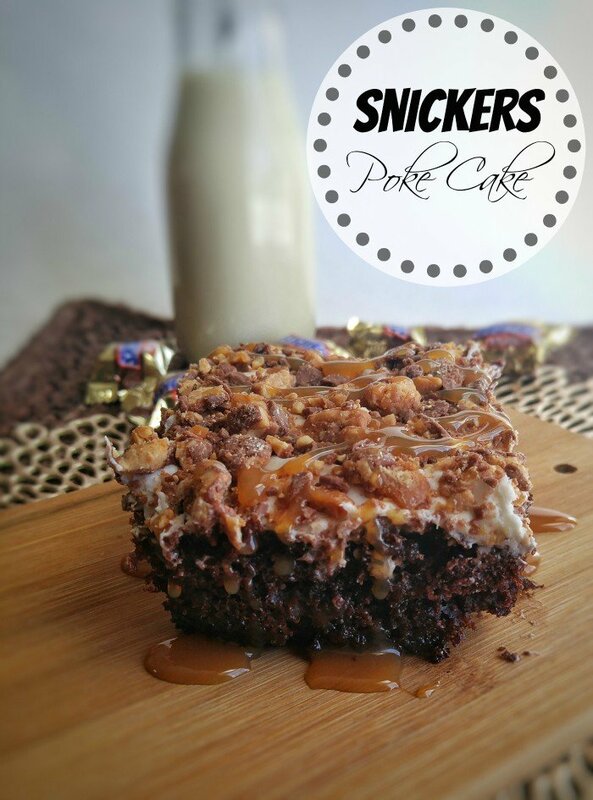 Have you ever heard of or tried a poke cake recipe? They are absolutely amazing. I have one you can find here that is coconut in variety.Don’t mind the pictures, I’m working on updating old posts to look a little more visually appealing. That cake was amazing just as this one. Two totally different flavors though. 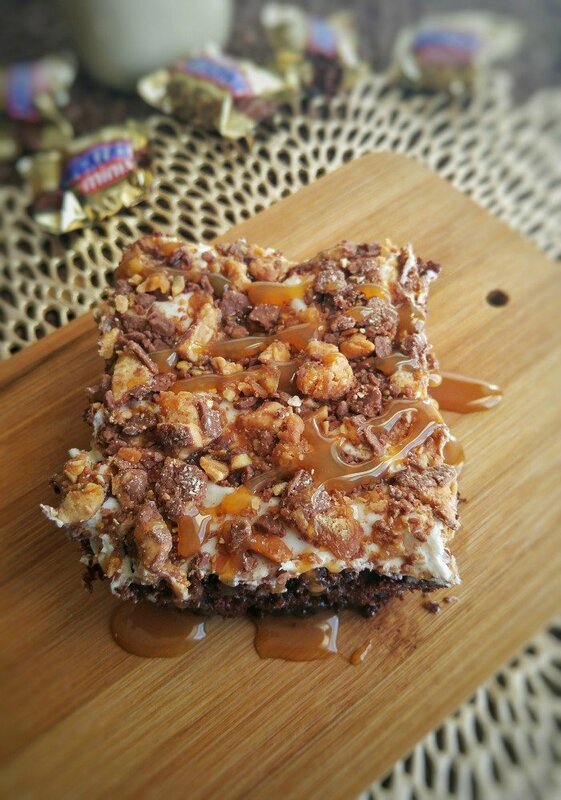 This recipe is a chocolate cake, soaked in caramel sauce, frosted and drizzled with more caramel sauce and chocolate syrup and sprinkled all pretty with delicious Snickers bars!! Pretty much I love to call this heaven in a pan. My 2-year-old would constantly go up and try to scream cake at me letting me know that she wanted some. Even my chocolate hating child (yes I have one, and no I don’t know how they exist) told me that this cake was good. So that is telling you something right there! It’s easy as heck and whips up in the blink of an eye, which is good because it disappears just as fast. A rich chocolate cake soaked in caramel, frosted and drizzled with more caramel and chocolate then topped off with crushed Snickers bars. Meanwhile in food processor chop up your mini Snickers. When cake is done, let cool slightly then poke holes all over the cake with a fork. Drizzle caramel syrup over the top of cake, using spatula spread syrup over top of cake and into holes. You can add more if you'd like. Once completely cooled spread with frosting. Drizzle cake with more caramel syrup as well as chocolate syrup. Sprinkle with Snickers and enjoy! We like more caramel syrup so adding more is encouraged! But not necessary. To see where I’m linked at visit my Link Parties page and join the fun. Don’t forget to join us every Tuesday and Thursday night’s at 6pm CST for Wonderful Wednesday and Throwback Thursday! Love. Love. Love. This looks so yummy. The ‘butter nut’ one looks amazing too. I’ve never had either variety of the poke cake. I’m thinking they need to be made soon! Thanks Jessica!! This was seriously sinful and I had to quit having it for fear that it was all I are haha. That looks delicious! Gimmie a fork! Thanks Michele I’m already craving more and getting requests. I would call this heaven in a pan too! Delicious! For sure, hands down. Easy and delicious. I love poke cakes!! I’ll have to try this one!! Thanks for joining us Stephanie. OMG these look AMAZING! I’m trying these this weekend! Thanks so much for sharing at #funtasticfriday! Thanks so much for sharing this absolutely decadent recipe with us at the Over the Moon Link Party. Woohoo thank you so much Marilyn! !